In the previous 20 shutdowns going back to 1976, stock prices have rarely moved significantly lower. "Although shutdowns get a lot of media hype, the reality is that stocks tend to take them in stride," says LPL's Ryan Detrick. As a government shutdown seems more and more imminent, investors are pondering what it will do to the stock market. If history is any guide, the answer is: nothing. 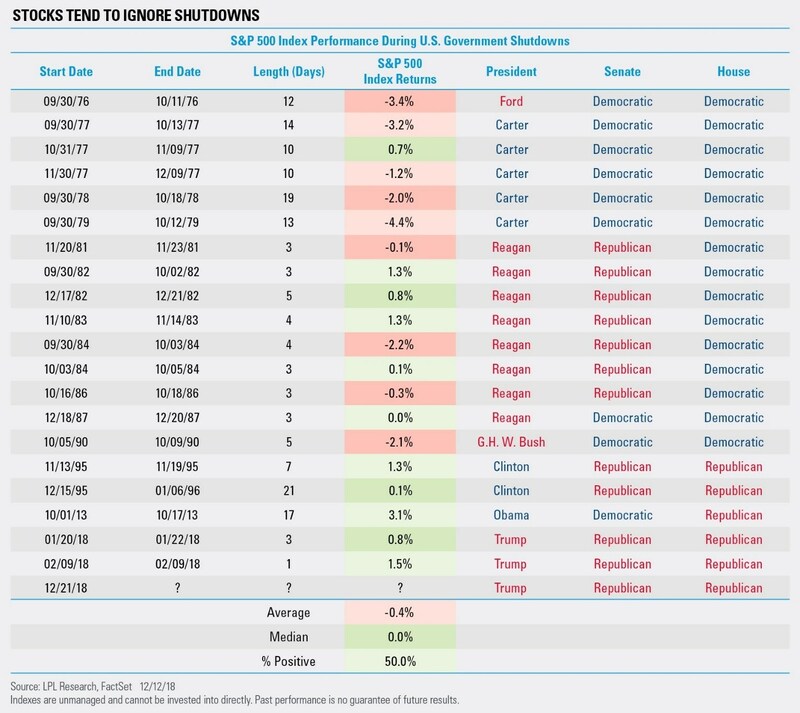 In the 20 previous shutdowns going back to 1976, stock prices have rarely moved significantly lower and in fact, they have posted a flat median return during the government closures, according to data from LPL Financial Research. "Although shutdowns get a lot of media hype, the reality is that stocks tend to take them in stride. In fact, the S&P 500 has gained during each of the five previous shutdowns," said Ryan Detrick, LPL's senior market strategist. The Senate on Wednesday approved funds for several federal agencies to keep them operating through Feb. 8 without the $5 billion to build a wall on the U.S.-Mexico border that President Donald Trump had demanded. Trump has rejected the bill, and on Friday warned of a "very long" closure if lawmakers do not approve money for the wall. The stock market has had a tough week with the S&P 500 down about 1.5 percent on Thursday and 7 percent this week alone. But Thursday's steep sell-off had little to do with the shutdown fears, traders previously told CNBC. Instead, the stock market's underperformance came from the Federal Reserve's decision on Wednesday to hike interest rates and let its massive balance sheet shrink at the current pace. Many market participants had hoped the central bank would slow its pace of rate hikes more quickly, and they worry the Fed is slowing the economy too fast with its balance sheet reduction.